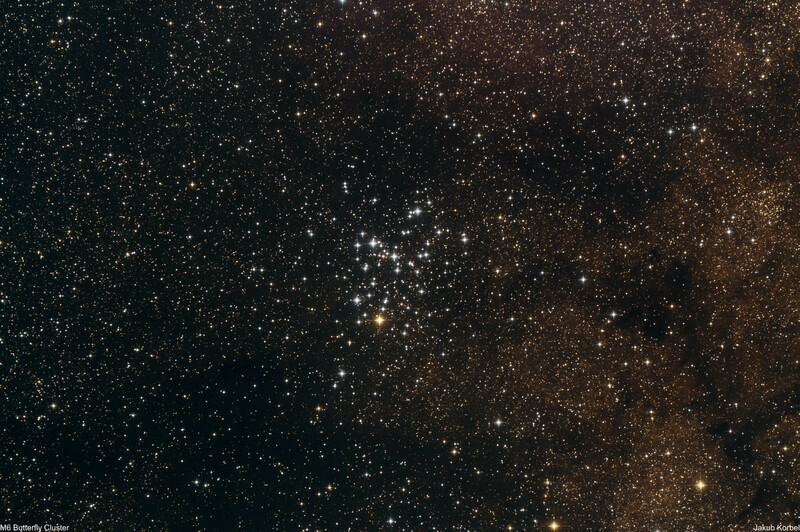 M6 is an open cluster located in constellation Scorpius. Visually it’s located not far from horizon, at least from Central Europe; therefore it’s hard to capture this deep space object. The observing/capturing conditions change significantly if you travel to Southern Europe. From there the cluster is visible by naked eye. The stars from similar shape to butterfly, therefore it got its name. On the bottom side of the cluster is nicely visible red giant (orange star) called BM Scorpii. The background illuminates the Milky Way. The picture was taken during chasing darkness on Greek island Milos and in total was taken 30 pictures having exposure 180 seconds, i.e. total 90 minutes of integration.